Task: To check alignment, flatness, straightness, and parallelism of both X axis rails. Issues: The machine could not be run over 50% federate or it would fault out. 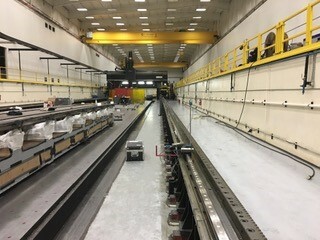 What we found: Using our Hamar L-723 laser we shot into the travel of the X axis on the master side of the machine for straightness and hung a target from the spindle and shot into 3 points in the vertical axis to determine a flat plane in relationship to the machine travel. We checked some points on both rails for elevation as well as straightness and found some errors. 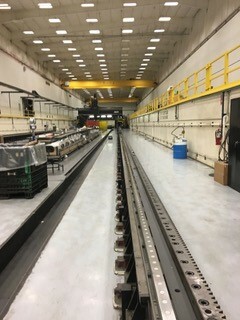 We then set up 2 reference targets to move the laser to the other side of the machine to look at rail parallelism to the master rail. We found that the rails were going away from one another, so they were not flat or parallel. Upon going through the evaluation process we ended up pulling a lot of shim out from under each rail. They did set the machine on Unisorb RKIII fixators which is an excellent thing to do, but they did not do a very good job of making the rails level in the first place. So there was a tremendous amount of shim on top of most of the fixators. We had to break every fixator loose and start from scratch, a total of 648 fixators! In the end we made both rails flat, straight, and parallel. We bought 2 new trucks to use our targets on, so we had one vertical and one horizontally as well as a level across the truck to make sure we kept the rail flat. Once the rails were flat and straight we then had to make sure the bridge was perpendicular and square to the X axis. Once those were aligned we then used our Renishaw XL80’s to perform the linear calibrations. We had a laser on each side to make sure we shot both sides simultaneously.